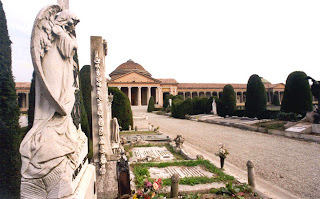 The cemetery of San Cataldo consists both of an ancient and a recent part. The ancient one was carried out by architect Cesare Costa from 1858 to 1876 and contains a lot of artistic great value handmade while the recent one was built on the basis of architect Aldo Rossi's project. The cemetery of Aldo Rossi is an analogical route through the collective images of the "house of the dead". The building, today partially completed, is structured in such a way as to confine wide green spaces further marked by a criss-cross of pedestrian paths. The various building complexes run parallel to each other towards the central "vertebral" axis which objectively, almost "physically", links the orientational lines of this section of the project. The rhythmic articulation of the openings, framed by the cold neatness of the surrounding walls are to this day interrupted in counterpoint only by the central cubic element destined for the ossuary which, when the works have been completed, will be in visual balance with the conic tower of the common grave, also thanks to a decisive colour differentiation of the walls, instrumental for clear perception and identification within the sphere of the surrounding townscape. Oglejte si San Cataldo Cemetery in Modena, Italy na večjem zemljevidu.